There’s been quite a buzz recently among athletes and health enthusiasts, on how to more quickly and easily recover from acute or chronic inflammation and injury through earthing. The term ‘earth’ is used often in Europe and equates to what we also call ‘ground’ here in America. A ‘grounded’ human being is someone who is connected to and receives direct benefit from the infinite free electron source generated directly from our planet. We’re grounded when we hold the same electrical potential as the Earth’s surface. 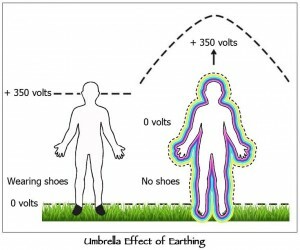 Electrons are absorbed or discharged via the skin, mainly through our feet in contact with the ground. This is an ancient and profound yet hugely common sense principle of well-being that’s currently resurging amidst enthusiastic stories of its success. It’s well accepted that electrical systems of our homes or sophisticated electrical equipment must be grounded to function safely and effectively. But how much have we considered the human body as being fundamentally bio-electric in nature, also working more optimally with grounding, and suffering adverse effects from the lack of it? The universe is all about energy! Simply put, energy is universal information in motion within and around everything. It’s very fast moving so we perceive only a very small percentage of it through our five senses; usually, we can notice only its effects (think radio signals, ultrasound, or even love). Its electrical charge is that spark of life that animates us, and has been well regarded for thousands of years primarily by eastern and indigenous cultures – who’ve actually studied its properties and called it by many names – Chi, Qi, Ki, Life Force energy, prana, mana, orgone, electrons, Shakti, kundalini, and more. Our universe is alive due to interactions of energy. All our thoughts including perceptions, beliefs, wants and needs, all our emotions and feelings, our sensations and movements, and our anima or spirit are the outcomes of this essential substrate of energy. Surrounding and permeating each living thing– from this living, breathing planet down to the smallest single cell organism – is a bio-electromagnetic field. This field is a function of the vitality present in that being. In another’s presence you may sense this as radiance or a glow. Or you feel a charge of electricity when approaching someone with whom you share a mutual attraction. We’ve all felt surprise due to shocks by static electricity; at those moments we’re a conductor for that excess charge. On a much grander scale, the more than 5,000 lightning strikes per minute globally constantly refresh the Earth’s almost unlimited supply of free electrons. To illuminate how immensely powerful this force is, a single lightning storm can contain more energy than ten atomic bombs. All our body’s trillions of cells function electrically. Each cell is like a battery; it runs at a specific millivoltage and frequency. Generally speaking, disease is caused when cells have too little voltage and are running at too low a frequency. Ultimately our health depends on the electrical charge maintained within and around our cells and our organ systems. The body seeks to maintain homeostasis– a state of balance. Unstable, highly reactive free radical molecules (caused by tobacco smoke, sugars, x-rays, pollution, etc) have unpaired or ‘stray’ electrons so they ‘steal’ electrons from healthier cells to regain stability. But this causes oxidative damage to those cells that then also turn into free radicals and thus a chain reaction of damage begins. Inflammation, disease and aging are attributed to this free radical damage. Antioxidants help reduce damage from free radical reactions because they donate electrons which neutralize the radical without forming another. The influx of electrons from grounding provides an externally sourced natural antioxidant effect, and gives the body another raw material to heal itself. 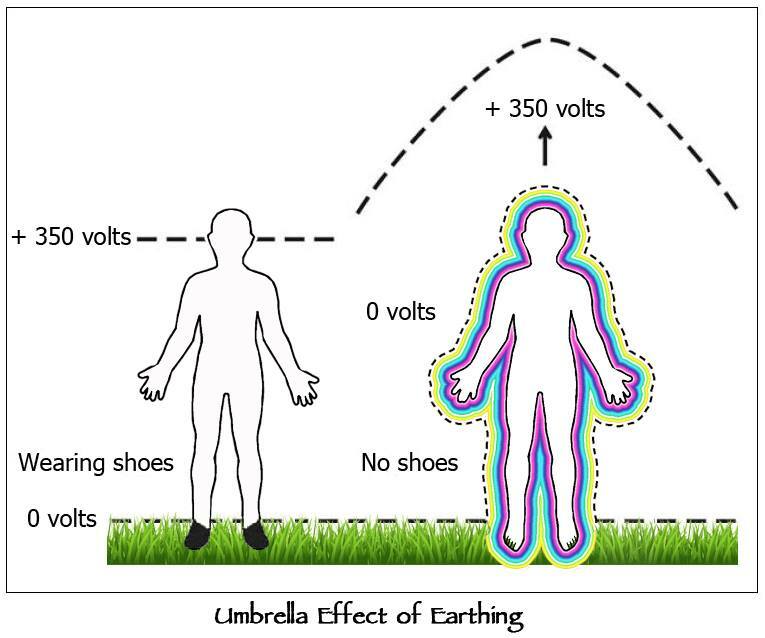 A simple voltmeter test offers direct evidence how grounding eliminates excess electrical charge (and thus helps inflammation), by bringing the body into electrical balance with the Earth. For energy-depleted persons, grounding helps by uploading vital electrons, reenergizing the body’s’ electrical state. Its energy continuously works towards our body homeostasis by either delivering or absorbing electrons. Grounding balances us and helps us feel whole again. Who wouldn’t want this infinitely huge vital life force on her or his side, available 24/7 towards greater health and a sense of well being? Our ancestors lived much more closely to the earth on dirt floor dwellings, often slept on the ground perhaps under stars, and worked daily barefoot or shod with minimal foot coverings. There was an awareness and respect for influential cycles of nature and the ebb and flow of life. Seasonal rituals and ceremonies were hallmarks of celebrating Nature. Remember the barefoot joy you felt running around outside as a child? Where did that joy go? Collectively we’re driven almost nonstop to be acquisition motivated by consumerist mentality, constantly pressured by high living costs and economic disparity, and are ill from effects of degraded air, water and genetically and chemically modified, irradiated, pesticide treated foods. Megacorporations trump rights of individuals while depleting precious natural resources. The needs of the many are preempted by and for the wants of a few. We’ve insulated ourselves from Nature. We live mostly indoors, and walk in synthetic footwear and high heels on asphalt and carpets. We are swimming (drowning?) in an ever-growing and pervasive invisible sea of harmful electromagnetic fields and frequencies (EMF). Face it – we’re stressed out! Unlike all other species ever to have lived on this planet, it seems that overall our human race has lost our way, our essential connection to this paradise, and our ability to live sustainably. We often forget or ignore that it’s only by this grace and generosity of the Earth our original and true mother, that we may sustain this physical life at all. Our survival as a species is intimately linked to a healthy relationship with our environment. So tell me – are you communing lovingly with Nature? Do you feel gratitude as She feeds you, quenches your thirst and washes you, clothes you, breathes life into you, soothes your soul with Her beauty, Her breath, Her songs? Do you feel a healthy respect and awe for Her enormous elemental powers of creation, sustenance, and destruction? Do you have a direct, up close and personal relationship with Her? How do you feel Her, touch Her, smell Her, taste Her? When last did you lay your body down on this Earth and exhale a sigh of relief? Perhaps now in this eleventh hour, after so much worldly suffering, stress and angst, we will personally activate change by taking a step or two – barefoot steps – onto the living earth, to simply be present to the enormous power we stand upon. Such a basic action of a single human being reverberates throughout the entire cosmos. Imagine how we may create a larger shift when we get grounded by the millions. Here’s the easiest way to ground yourself: Go barefoot on Earth – walk, lie down, stand, or sit in a chair with your feet on the ground for awhile each day. You could begin with just twenty minutes daily…longer and more often is even better. On damp earth or at water’s edge is best, as moisture enhances conductivity. Our tissues know how to ‘soak up’ and use these electrons so that, over time, our bodies may recharge and heal. Do you know your total radiation exposure?